Investigation of the importance of attachment between baby and caretaker—usually the mother—in setting the path to physical and mental health. In a follow-up to their Ghosts from the Nursery: Tracing the Roots of Violence (1998), family therapist Karr-Morse and Wiley, state director of Fight Crime: Invest in Kids in New York, write that without that bond, there is danger that a baby will be stressed, triggering the hypothalamus-pituitary-adrenal axis and flooding the baby’s developing nervous system with flight-or-fight hormones. The baby, unable to flee or fight, may succumb to trauma, defined as being frozen in fear. 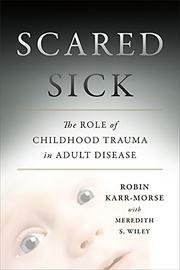 Such trauma is the root of being “scared sick”: suffering ills that may not appear until later in life. Among many others, these can include autism, Alzheimer’s, addiction, ADHD, schizophrenia, PTSD, suicide, chronic pain, obesity, heart disease, diabetes and cancer. The authors look at scores of surveys, correlations, retrospective analyses, animal studies and expert opinions, laced with dramatic statistics. They do not ignore poverty, nutrition, illness, injury or other negative risk factors, but the first half of the book is such an overwhelming recital of trauma’s legacy that it may arouse skepticism in some facts. To be sure, infancy and toddlerhood are critical times in development, and the authors are solidly in the line of such pioneers as John Bowlby and Harry Harlow. Karr-Morse and Wiley shore up their thesis with a chapter indicating that in infancy the more emotional right brain develops at a faster rate than the left, as well as a chapter on epigenetics to explain how trauma may reset which genes are turned off or on. Finally, the authors provide an array of therapies and resources to ameliorate the effects of trauma, most involving some physical actions and establishing trust with the therapist. A wake-up call? Absolutely. Readers don’t need to buy all the data to get the message, especially where events in America and abroad conspire to increase child poverty and deprivation.